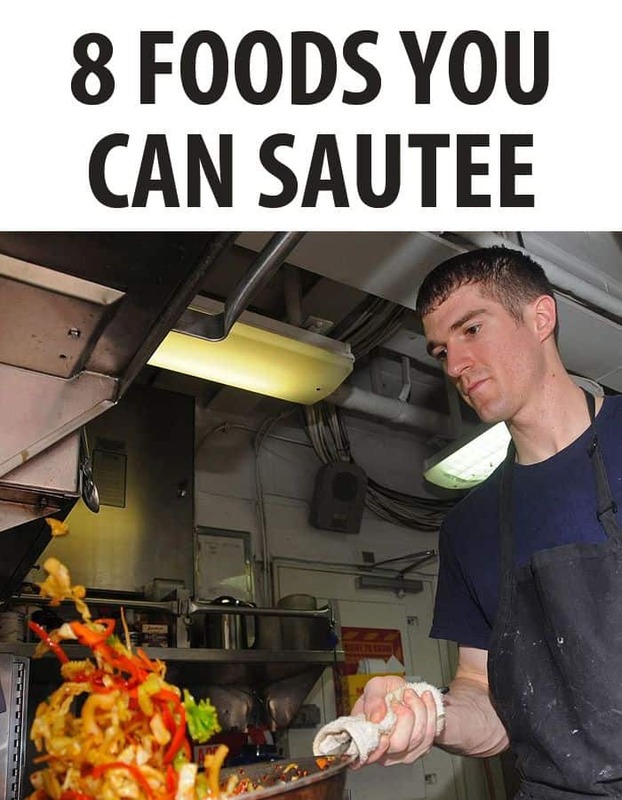 Sautéing is a cooking technique that basically consists of cooking something quickly in a pan, over a relatively high heat, using a tossing, rather than a stirring, motion. Due to the fast cooking time, the ingredients being sautéed are able to retain a large amount of their nutrients and texture, while achieving a browning that gives them an even richer flavor. Are you looking for some inspiration in the kitchen? If so, here are 8 foods that taste truly exceptional when sautéed. Sautéed mushrooms have a deep golden-brown color, along with an exquisitely tender texture, but can actually be quite difficult to make. This is because of the high water content that most mushrooms have, which is released as soon as they are heated, resulting in them boiling and steaming in their own water rather than being sautéed to perfection. 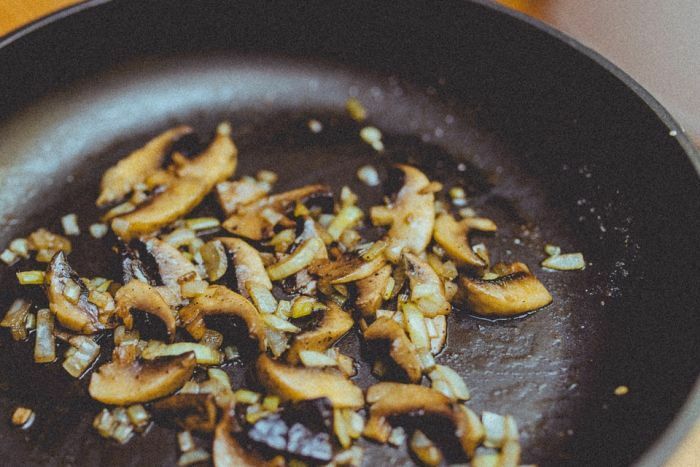 The secret to sautéing mushrooms is to cook them over a higher heat than you would cook other vegetables, as this encourages the extra moisture to evaporate faster. You also need to make sure that you do not over-crowd them in the pan. If you do, too much water will be released, lowering the pan’s temperature and preventing the mushrooms from browning. In terms of the best fat to use for sautéing mushrooms, clarified butter tends to be easier than standard butter, as this does not have such a low burning temperature. Duck fat, bacon fat or lard also add a deeper flavor, while olive oil lends the mushrooms a lighter, fruitier note. Parsnips are most commonly roasted, but sautéing them really elevates them into a much more elegant, classy dish. It also leaves your oven free for anything else you may be cooking! Peel your parsnips and then cut them into sticks, doing this with carrots too for some extra texture, color and flavor. Saute them until they are beginning to brown around the edges, which usually takes around 12 minutes. At this time you add in any extras, such as butter, honey, and herbs, before tossing them for another five minutes or so, until they are cooked through. It is quite easy to get cabbage wrong, but sautéing it gives it a sweet, caramelized tenderness that works with just about any meal. All you need to do is heat some butter or oil in a pan and then add in some shredded cabbage, as well as salt and pepper. It will take around ten to fifteen minutes for the cabbage to become tender, as well as to start browning around the edges. There are so many other flavors that you can add to this dish, from nutmeg to garlic to apples. Delicious on its own, or added in to other dishes, sautéing is a quick and easy way to cook up some shrimp. The key here is not to overcook it, as this will lead to it becoming tough and chewy rather than succulent and tender. Simply heat some oil in your pan, over a medium-high heat, and then add in the shrimp. Make sure that you do not over-crowd them, and sauté them in batches if you have more than what you can fit into your pan. After a minute or two, you will see that your shrimp have turned pink, and have begun to curl up. Immediately remove the pan from the heat and transfer the shrimp onto a plate. If you leave them in the pan, even when the pan is not over any heat, they will still continue to cook due to the existing heat in the pan. People who hate Brussel sprouts are probably used to having them boiled until they have become a soft, tasteless, smelly mess, but sautéing them completely transforms this humble vegetable into an exciting culinary experience. Brussel sprouts have a beautifully nutty flavor to them, which is brought out in a whole new way when sautéed, and the caramelization that takes place really adds to them visually. All you need to do is cut your Brussel sprouts in half, before heating some oil in a pan, using enough oil to cover the base of the pan. Place the sprouts, cut side down, into the pan, in a single layer, and sprinkle over some chopped garlic and shallots for extra flavor. After about five minutes, you should be able to smell a beautiful caramelized scent coming from your sprouts, meaning that now is the time to turn them over and allow them to cook for another five minutes or so. Then, add in about a third of a cup of water, or a stock of your choosing, and continue cooking the sprouts until all of the water has evaporated, which usually just takes an additional two minutes. This is a great dish to experiment with, as adding in everything from pancetta to walnuts to chestnuts can really give the sprouts a unique twist. There is something so comforting about sautéed spinach, and this dish only takes about five minutes to cook up. You will need around ten ounces of spinach for two servings, as the leaves really do shrink down once they are heated through. Simply heat a couple of tablespoons of oil in your skillet, before adding in the spinach and cooking for a few minutes until it has wilted. Shallots are a great ingredient to add in to this dish, and garlic is an absolute classic, working incredibly well with the spinach. Radishes are known for their crispness, spiciness and zest, and tend to have quite a bit of heat to them, although this does depend on the specific variety. Sautéing them changes this, bringing out a sweetness and mildness that you would have otherwise missed. All you need to do is cut them in half and place them in a hot pan with oil or butter, cut side down, over a low heat. Cook them for around seven to ten minutes, until they have softened and turned a slight golden color, shaking the pan occasionally. Once they are done, transfer them to a plate and season them with salt and pepper. Chicken livers are incredibly nutritious, packed with a wide range of vitamins and minerals. Sautéing them is a quick and easy way to cook them, and they can be served either as a snack, or as part of a larger meal. One common factor that all of these foods share is that they are all naturally tender ingredients. This is important, as they are not spending much time in the pan, whereas tougher and denser ingredients would likely need to be blanched before being sautéed. Nevertheless, just about any ingredient can be cooked in this way. What are some of your favorite foods to sauté? Share your favorite recipes with us in the comments section below.